Once per turn, during the Standby Phase, if your opponent controls a face-up monster that was Special Summoned from the Extra Deck: You can Special Summon this card from your hand. Cannot be destroyed.. Cannot be used as Synchro Material except for a Synchro Summon by its own effect. 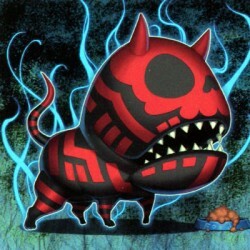 During your Main Phase, if this card is Normal or Special Summoned: You can target 1 face-up monster your opponent con.. If this card is Normal or Special Summoned: You can target 1 face-up monster on the field; that target is treated as a Tuner this turn. You can banish this card from your Graveyard, then target 1 Fien..
To Tribute Summon this card face-up, you can Tribute a Continuous Spell/Trap Card you control, instead of a monster. Once per turn, during either player's turn, when your opponent activates a card or .. If this card is in your hand: You can destroy 2 other monsters in your hand and/or face-up on your field, including a WIND monster, and if you do, Special Summon this card, and if you do that, and bot.. Cannot be used as an Xyz Material for an Xyz Summon, except for the Xyz Summon of an Insect-Type monster. Once per turn, when this face-up card is changed from Attack Position to Defense Position: You..
Once per turn: You can reveal any number of "Nekroz" cards in your hand; increase or reduce this card's Level by the number of revealed cards until the end of this turn. If this card is Tributed by a ..
Pendulum Effect:- Once per turn, during your Main Phase, if this card was activated this turn: You can target 1 of your Pendulum Monsters, that is banished or in your Graveyard, except "Pendulumucho";.. If this card is Normal or Special Summoned: You can draw 1 card, then place 1 card from your hand on either the top or bottom of your Deck. If this card is destroyed by battle or card effect: You can ..